I was watching the Home and Garden Network the other day. Now, that channel is not my usual fare, but I'm doing some remodeling around the house, and they have some cool programs on there for that kind of thing. For some reason while showing bathroom fixtures, faucets, sinks and the like, they showed this travel toothbrush. You evidently place toothpaste in there and it comes out through the brush bristles when you need it. I thought I'd never see a travel toothbrush go upscale. Well, if it promotes better oral hygiene, then I'm fine with that! Hey, you have to be on the cutting edge of style even in dentistry. The ideal "away-from-home" toothbrush. Great for traveling, dorm, living, desk storage at work, camping, between-meal brushings, and carrying in a handbag, briefcase, gym bag. 1. 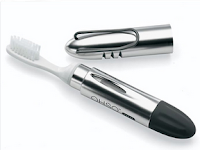 Toothbrush and Toothpaste are combined into one easy-to-carry unit. 2. Rotate the end knob and get the proper amount of toothpaste on bristles. 4. Easy to use and refill. Each filling can supply 20-30 brushings. 5. The visual window of the tube allows you to see the amount of toothpaste that has been used. Website, http://www.2-in-1.com.tw/E2.htm for more information. Nice blog! As for the product, I'm not too enthused... looks really big to tote around...also for frequent air travelers, you never know when the regulations change and they won't allow toothpaste or will make a big fuss over a metal novelty object like that. A better idea: prepasted brushes. I like Dr Collins from dentist.net cause you can use it again and it has special bristles. As a tooth fanatic and frequent traveller, I have to throw in my two cents...I've tried the Gum line of travel tooth brushes and other fancy ones, but I agree with Jon; prepasted brushes are definitely the easiest way to go. I also like the Dr Collins line. Flix, also available at dentist.net, are another great find for oral hygiene on the go.